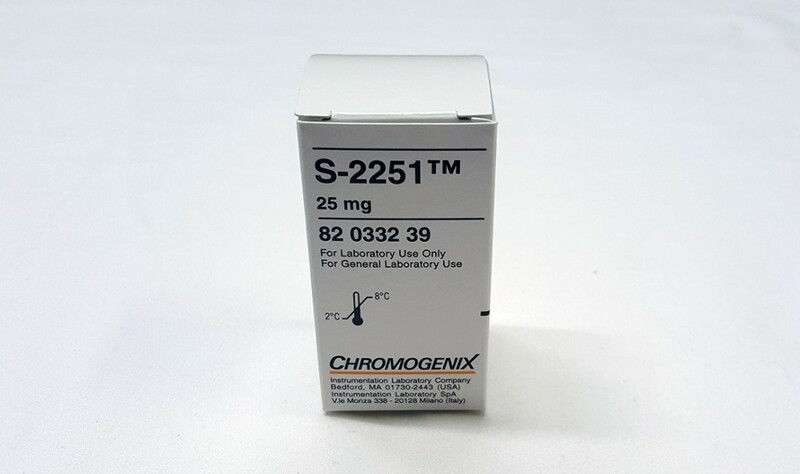 Each vial contains chromogenic substrate S-2251™, 25 mg and mannitol 60 mg as a bulking agent. Stability: Substance: Stable until expiry date if stored at 2-8°C. Avoid exposure to light. The substance is hygroscopic and should be stored dry. Solution: 3 mmol/L in H2O is stable for at least 6 months at 2-8°C. Contamination by microorganisms may cause hydrolysis. Plasminogen (MW: 92 Kda) is the zymogen form of plasmin (83 KDa). The activation of plasminogen is accomplished by t-PA, urokinase or streptokinase. It is not the purpose of this text to describe the mechanisms of activation of plasminogen and its inhibition, but it is important to underline that they can affect the reaction of the active enzyme with chromogenic substrates, casein or fibrin. For more information refer to Gaffney (1). 1 ml of normal plasma contains about 180 µg or 2 nmol of plasminogen. The activity of plasminogen can be expressed in casein units (CU) e.g. for example to Sgouris et al. (2). Friberger (3) found that the amount of plasminogen in 1 ml of normal plasma corresponds to 3.8 CU, as determined by the chromogenic method described (streptokinase activated plasminogen). 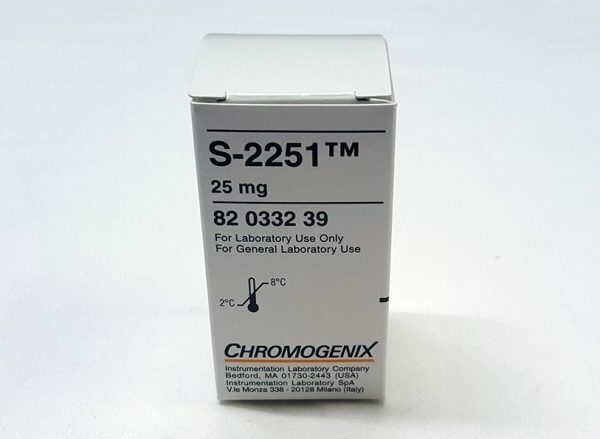 The Chromogenix plasminogen reagent when activated with streptokinase shows an activity of 7.3 nkat chromogenic substrate S-2251™ per CU. In 1983 Friberger (4) reported that 1 µg of plasmin corresponds to 0.20 nkat chromogenic substrate S-2251™, or to 0.024 CU or to 0.028 CTA-U. In 1975, the first standard for plasmin was established (5) and the international unit was defined equivalent to CTA-U (5-6). This contained a purified human plasmin in 50% glycerol. When tested by Friberger et al. (7) , it showed about the same activity as the Kabi preparation in terms of µmol of substrate hydrolysed per minute per unit of enzyme. Since then the different aspects of caseinolytic, amidolytic and fibrinolytic activity have been explored in details and, the discrepancy between amidolytic and fibrinolytic activity in reference preparations was underlined as in the case of the 2nd International Reference Preparation of plasmin in 1983 (8). The current 3rd International Standard for plasmin, 97/536 was established in 1998, and the results presented at the Fibrinolysis Subcommittee of the Scientific and Standardization Committee of the International Society of Thrombosis and Haemostasis (Ljubljana, Slovenia, June 1998). The 2nd International Reference Preparation was used as reference material and a chromogenic assay was the method used. There is no established WHO standard for plasminogen, but the National Institute for Biological Standards and Control, established the Ist British Reference Preparation, 78/646 (9). It is a preparation of Glu-plasminogen, assayed by fibrinolytic and chromogenic methods against the 2nd International Standard for plasmin. Complete activation of plasminogen was achieved by both urokinase or streptokinase and the activity was comparable to that of the reference preparation of plasmin. Standardization of plasminogen assays. Haemostasis 18 Suppl. 1, 47-60 (1988). The preparation of human fibrinolysin (plasmin). Vox Sang 5, 357-376 (1960). Friberger P and Knos M.
Plasminogen activation in normal plasma. In: Chromogenic peptide substrates, Eds, Scully MF and Kakkar VV, Churchill Livingstone, 128-140 (1979). A standard for human plasmin. Thromb Diath Haemorrh 34, 20-30 (1975). 28th Report, WHO Expert Committee on Biological Standardization. WHO Tech Rep Ser No 610; 1977, pp 13. A new specific substrate for the determination of plasmin. In: Chromogenic peptide substrates, Eds, Scully MF and Kakkar VV, Churchill Livingstone, 121-127 (1979). Gaffney PJ and Mussett MV. International collaborative study for the establishment of the second international reference preparation of plasmin. Thromb Haemost 50, 645-649 (1983). Gaffney PJ and Curtis AD. The establishment of a standard for plasminogen. Thromb Haemost 51, 376-378 (1984).